TreeSize Professional is a powerful and flexible harddisk space manager for Windows. Find out which folders are the largest on your drives and recover megabytes on them. 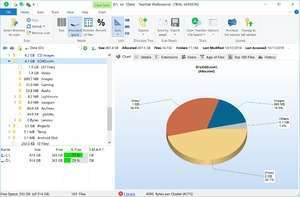 TreeSize Professional shows you the size, allocated and wasted space, the number of files, 3D bar and pie charts, the last access date, the file owner, the NTFS compression rate and much more information for several folders or drives you choose. It also lets you search for old, big and temporary files. TreeSize Professional 7.0 is a shareware program and can be used as a demo to try the software until the free trial period has ended. A full version of the program is available after the trial period ends. For security reasons, you should also check out the TreeSize Professional download at LO4D.com which includes virus and malware tests. Additional screenshots of this application download may be available, too. TreeSize Professional has a presence on social networks. TreeSize Professional download been highly rated by our users.